This is WONDERFUL! LOVING those lights!!!!! This is so cute. I have just used some of the wonderful designs at The Cutting Cafe too this week. I am glad there is a way that we who cannot use the SVG system can just use a fussy cut system. Awesome treat box! Your tree is just so stinkin' cute...and festive! OH my goodness this is adorable!! Love the fiber you've wrapped around it.. awesome! What an adorable little gift box! I love the mini lights strung across the front! Sooo cute! BTW - thanks for your sweet comment on my first RI post! It would have been fun working with you! Beautiful tree box, Patti. And great idea to add lights. Ohhh that's the sweetest treat box Patti, you definitely are the best in blogland at these! What a wonderful and fun little gift box! 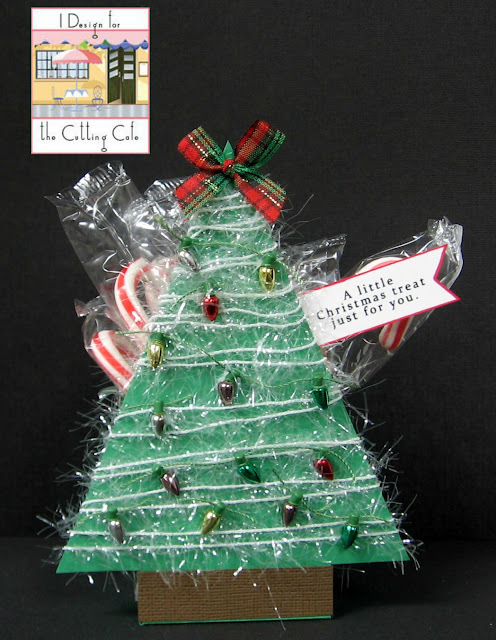 And the candy canes look great with the sparkly tree. Oh so cute, Patti. Nicely done.